Two May Bank Holiday weekends give us the perfect excuse to hitch up the caravan and get out and about to some of the UK’s best attractions. It’s the time of year that gives the proper feeling that summer is just around the corner so moods lighten and weekends away are planned. If you’re looking for inspiration of what to do and see over one of the next Bank Holidays then why not consider these. They can either form part of a longer weekend in one area or enjoyed as a day trip. You can combine a trip to the Transport Festival on the sea front with the Victorian festival held in Llandudno on the same weekend. 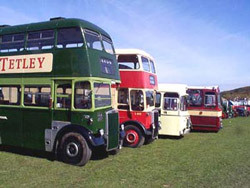 The transport event will feature more than 1,000 exhibits including lorries, buses, tractors, motorbikes, cars, stationary engines, an auto jumble and many trade stands. Visit www.llantransfest.co.uk. Stay at: Conwy Touring Park, Bwlch Mawr, Iolyn Park, Conwy, LL32 8UX. Tel: 01492 592856. 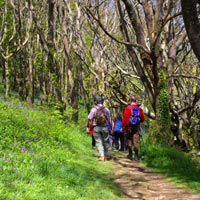 A festival full of guided walks that gives visitors the perfect opportunity to explore beautiful countryside. There are half-day walks, midrange and longer walks as well as specialist ones. These include flying a Harris hawk, tracking with a local expert, ‘gourmet’ walks, photography walks, red deer and pony hunt walks and more. Book before you go to avoid disappointment. Stay at: Greenacres Touring Caravan Park, Bratton Fleming, Barnstaple, Devon, EX31 4SG. Tel: 01598 763334. Cheese Rolling, Cooper Hill, Gloucestershire. Coopers Hill – Where the cheese rolling takes place! A popular custom that has taken place annually for hundreds of years. Locals go head to head with national and international competitors to be the first to the bottom of the hill, chasing a 7lb-8lb double Gloucester cheese, as you do. A madcap event but worth a visit if you’re spending the weekend in Gloucestershire and fancy some entertainment! Norton, Gloucester, GL2 9LW. Tel: 01452 731810. Castles in the Air, Penrith, Cumbria, The Lake District. As part of a new season of world-class performance and arts events, Bank Holiday Monday in Penrith will be full of eccentric characters and incredible feats. Its highlight comes at 1pm when 100 performers from Catalonia will build ‘human castles’ seven and eight stories high in the UK premiere of what organisers call ‘a never-to-be-forgotten spectacle’. Visit www.lakesalive.org. Stay at: The Quiet Site, Ullswater, Penrith, Cumbria, CA11 0LS. Tel: 07768 727016.